So instead of posting the promised narrative on what my awesome forever classmates did from November of last year until the end of the last semester, I, yet again, post something else. So I’ll be going to Japan in less than a week. And I still haven’t finished my papers yet. It’s actually one of the reasons why I haven’t been posting like I said I would as much as I wanted. On another note, I’m actually making progress on the narrative about what my wacky awesome forever classmates. Yes, it’s that long. It’s nowhere near done yet (as I find myself updating my organizer/planner every…twelve hours? regularly these past few weeks months). One of the things I really found myself pathetically deliriously happy about is that I actually got to spend some time with my best friend. You see, we didn’t really see each other a lot in the last two years. During the first semester of my second year, his first, we usually had some form of communication — text, chat, or Facebook posts that would put our actual chatbox to shame. Oh, and of course, we called each other. Not really that often, but as I’ve posted before, we tend to go on for hours at a time, and not necessarily talking all the time either. I think I creeped you out with wrote a post about it before. During the second semester though, he switched from using a phone to a tablet. Lazy arse that he is, he doesn’t text anymore, unless he had something to ask. Said it was too much of an effort to tap away on the screen. And tapping the keys of his cellphone multiple times wasn’t. Other interactions were kept to a minimum as well, since we were both busy with our own respective schoolwork. As usual, we didn’t really see each other often. Once or twice a month was already a lot then, and that would just be in passing. It was like we were in different universities rather than different buildings. Summer was okay. We probably saw more of each other during that time, compared to to the rest of the year. Plus, it had the added bonus of being with all our other close friends, the crazy ones who really fixed my sanity family and ultimately made my eighteenth birthday high school graduation ball high school life more enjoyable than I ever dared imagine. It was really great, since among all of us, only my best friend and I were in the same university. Bryan, my best friend, and I aren’t, in any way, the “perfect” friends depicted in some media. We’re more of the hey-I-haven’t-seen-you-in-a-long-time-so-I’m-going-to-hit-you-or-maybe-try-to-break-your-neck-for-fun type. We disagree on a lot of things (a lot of our conversations are about our opposing OTPs, our Pottermore Houses versus our real Houses based on our personalities, and the merits of ice cream over cake, among others), but we still get along pretty well. Mostly. When I’m not showing him how very much superior Zerith is over Clerith. But there’s one really big issue that always keeps rearing its ugly, deformed head and snatching our legs. Or arms. Or heads. It’s about trust, an issue of faith. You see, I’m probably one of the biggest cowards I know. Despite the normally scathing yet supposedly very helpful and disillusioning remarks and blunt advises to other people, I am a person who does not, cannot, place my full trust in anyone. For the life of me, and everyone else I care about for that matter, I can’t. I just can’t. Not even myself. Not even when my best friend said, asked, for me to place my trust in him. I couldn’t even answer him when he asked why. It’s probably a by-product of a somewhat traumatic childhood, the outcome of multiple and sometimes simultaneous betrayals from the people I least expected and least wanted to receive such a thing from. In very different ways. It’s how I found out that it’s usually the slow, subtle ones that hurt the most. They leave a lingering pain that has a very good potential of turning someone bitter and/or suicidal. Good thing I’m just unbalanced peculiar weird myself so I don’t really have anything to worry about. Now. It’s a long story, but I have my high school friends to thank and be with and harass with hugs and clinginess for it. But, well, going back to the topic. Right. So I’m a coward, and my best friend and I, normally unable to do so, met up for a “final” dinner of sorts for the year. We decided to go to a mall and just talk instead of the not-really-planned movie. And talk we did. We met up at around 4:30, stayed in a cafe until maybe six or so, went to the mall, fooled around in a bookstore (mostly ogling at books) and ate. (His treat.) All the while, we were talking. With our tones and not-so-few bursts of laughter, even and especially our expressions, one would think we were just really goofing off. But no, not really. In reality, we were discussing any and all things that made our friendship rocky enough that we, or at least I, was afraid that it was going to break. Not that I think about it, I knew it was coming. The talk, I mean. It wasn’t new; we really did talk about things like this. Mostly to make our friendship better or last longer, but sometimes we did it because…well, I really don’t know. We just did. At one point, he asked me the something regarding something he did in response to the many circulating rumours about us in high school, which he had dubbed as “stupid, irrational, alam kong masakit (I know it hurt you.) and sudden. But I would do it again in a heartbeat.” I had laughed it off what else could I do to keep that feeling of betrayal from sprouting? and told him that I would appreciate a warning of sorts before he started avoiding me like the plague in public and putting distance between us even in private, like deliberately making his replies to my texts short to annoy me so that I’d stop replying. Or talking to him at all. The immediate answer was that no, I did not. And I meant it, regardless of the fact that we had been in the Drama Club together for the better part of four years. We were walking beside each other, wrists locked overlapping hooked how the heck do you call it linked (instead of the usual interlinked arms or…hand…holding. Yeah, we’re weird like that. ), but we weren’t looking at each other like we normally did. It was the first time we weren’t looking dead set at each other’s eyes while having that sort of conversation. He took me by surprise when he brought up something that I hadn’t been expecting. I found ourselves talking about one of my biggest fears. The unspoken, “But do you want me to?” was ringing in my ears. I felt my eyes water, but I didn’t cry. That git. We were in public. I don’t cry in bloody public. Unless it’s a role. But he did too, I think. The words were ringing too loudly in my ears. This entry was posted in Friends, Life, Ramblings, Random Notes and Anecdotes and tagged "I won't walk away. 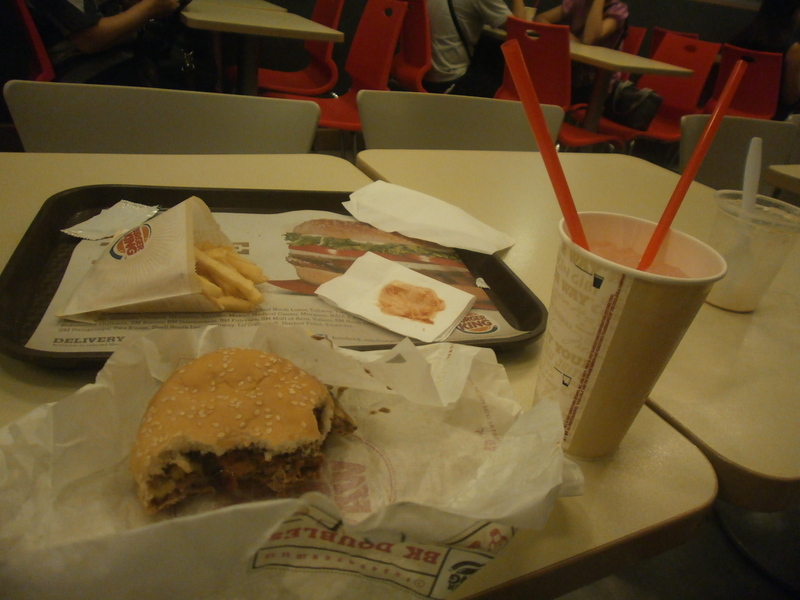 ", best friend, Burger King, creepy tendencies, fears, guilty pleasures, life, pre-Japan, ramblings, school, trust, truth.